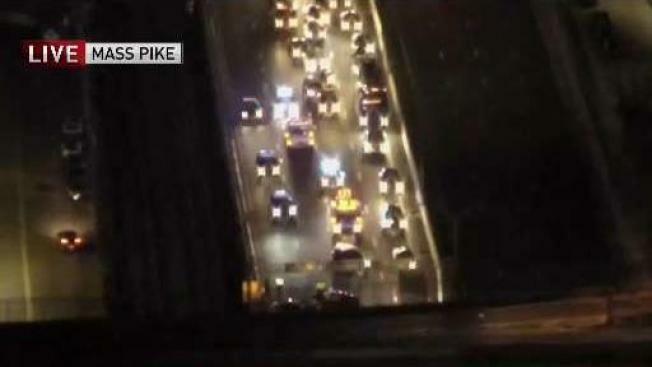 A Massachusetts State Trooper was hospitalized with minor injuries Friday after another driver believed to have been distracted rear-ended his cruiser on the Mass. Turnpike. State police said the crash happened at 4:40 a.m. when the trooper was parked to protect a road crew on Route 90 eastbound just before the Prudential Tunnel. The trooper, whose name was not released, was taken to Massachusetts General Hospital, where he was treated for minor injuries. He has since been released. Officials said they believe the driver of the other vehicle, whose name was not released, may have been distracted by his GPS. He will be cited, according to state police.